This is a hemispherical compass with a Cardan suspension, attributed to Christoph Schissler because of its decorations and the style in which it is engraved. It is equipped with a hook, used to hang it on the saddle-bow and a weight to keep it in place. It is supported on a wooden base and has a small cover on which a geographical map has been engraved and coloured with enamel. The compass has a burined leather case with golden decorations. It allowed direction to be measured during travel, without requiring the traveller to dismount from his horse. 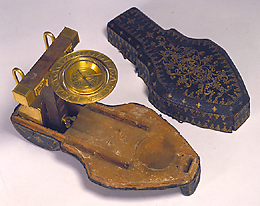 The instrument belonged to the collection brought by Prince Mattias de' Medici from Germany in 1635.